Although I'm primarily interested in growing persimmons as food for livestock, the persimmon has a long history as a people food. Here in the United States, Native Americans added the fruit to their cornbread as sweetener, dried the pulp for winter fruit, ground seeds into meal, and even made a beer-like drink by combining persimmons and honey locust pods. In Asia, persimmons were such a large part of the traditional diet that farmers cultivated varieties perfect for eating fresh and others just for drying, then planted them in large orchards. American cookbooks that are at least a few decades old often include recipes for persimmon bread and persimmon pudding, the former of which tastes to me a lot like banana bread. There are dozens of species of persimmons scattered around the world, but most people talking about persimmons are interested in just two species. The persimmon cultivated in Asia (and which you can find in fancy supermarkets in the U.S.) is primarily Diospyrus kaki, which has large fruits that ship well and often competely lack the puckery astringency that marks our native persimmon when the fruits aren't quite ripe. A few people grow the Asian persimmon (sometimes called "kaki", "Japanese persimmon", or "oriental persimmon") in the United States, but cultivation is risky north of zone 7, so I'm focusing on our native species. If you live in the Deep South, the Asian persimmon is worth looking into since you can find dozens of named varieties, at least one of which is bound to suit your needs. 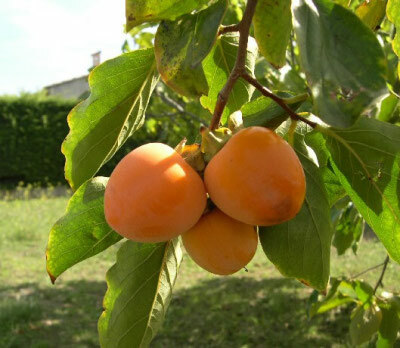 The American persimmon (Diospyrus virginiana) grows wild throughout the southeast and is often ignored by locals in modern times. Little work has been done on breeding tastier varieties and the fruits have to turn to mush before they are fully ripe, so they're impossible to ship and will probably never show up at your local supermarket. On the other hand, the American persimmon is a more dependable bearer of fruit than the Asian persimmon --- American persimmons bloom late and are almost never impacted by spring frosts. 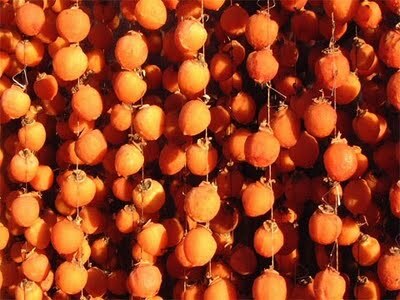 According to may people, the American persimmon has a better taste and is also higher in nutrients like vitamin C and calcium than the Asian persimmon. Nearest thing in taste to an American persimmon is a date. Can't believe an asian one can taste this good. Just be sure and eat them after frost. I'm curious about whether the Asian ones taste as good. I'd love to hear from someone who grows them and can do a taste test of homegrown fruits! I've had both and the ones produced here in NA are NOTHING compared to Asian ones. The imported ones purchased here are not so great but getting them fresh -- they're amazing -- smooth texture, full but mild sweet taste -- they were my favorite in the 8 years that I lived there. Some people let the Asian ones get too ripe before they eat them, too. You have to have them when they're ripe -- if you eat them early they have that gross too-ripe banana texture and aftertaste. If it's not a good growing zone for you then no worries -- but I did just want to put in a good word for the Asian persimmons -- make sure to have some if you're ever in Japan! That's exactly what I suspected. After all, they have been breeding persimmons in Asia for centuries. It seems to me that the flavor of an American persimmon compared to an Asian persimmon should be like comparing the wild type apple with all of the varieties we now munch on. Before last week I had never even heard of a persimmon (which I always accidently call a permisson). I tried a Fuyu persimmon and loved it. I was amazed not a week later and you're writing a whole series on it! Apparently you can grow some of the Asian varieties here in America. I think zones 6-10? I can't wait to learn more about it! I have noticed while poking around the internet that a few new varieties of Asian persimmons are supposed to be hardy in zone 6, but I'm a bit leery. The majority are only hardy to zone 7, and I think even there are much more likely to be affected by late spring frosts than the American persimmon. So this week's series is really about the American persimmon --- hopefully that'll still tweak your fancy! Please try to help me. I planted some persimmon seeds this Spring/Summer and all of them sprouted. Today July 19, 2012 they have 4 leafs. I know they will survive Summer but what about Winter time since I live in Ontario, Canada. Should I dig them out and when to bring them inside the house to overwinter, or should I try to protect them in the garden where I planted seeds. Should I bother at all because I am very (quite) old and there will not be time for me to see them growing into a big tree. Please, tell me everything you know and your personal suggestion what to do. Milos --- Persimmons hate to be transplanted, so they're a bad choice for planting outside their range and then digging up to take inside each winter. I would opt to protect them where they are, although I don't know how much luck you'll have with that in your climate. If you grafted an Asian Persimmon onto your seedlings next year, you'd end up with a smaller tree that should bear earlier, which would make it much easier to protect when it matures. anna, thank you so much. I will have to go to the garden centre and still some little persimmon tvig of Asian Persimmon to graft on to my seedling. I hope I succeed.